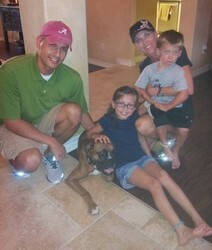 My family has successfully adopted our new family member; “Molly”, the Boxer formally known as “Winona Ryder”. Since joining our family, she has settled – in quite nicely, as if she has been around since day one. In a few short weeks, she has brought our family much joy, and has fulfilled a void we never knew existed. The Austin Boxer Rescue volunteers do remarkable work. Because of you, “Molly” was spared and now enjoys a decent life, while bringing much joy to others.